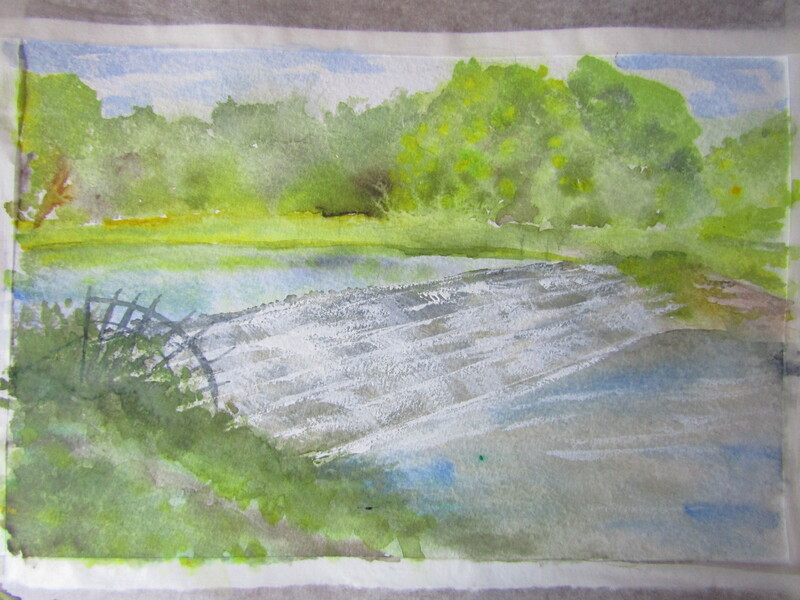 The object of this exercise was to experiment with landscape painting in watercolour. Luckily for me, although my paintings do not demonstrate this (! ), watercolour is one of my favoured mediums. I became much more aware of the importance of watercolour during this section of the course and the fact that until the 18th Century it was only really used occasionally in Europe for finished works. The course material speaks of the fact that Constable used watercolour for his preparatory studies for oil paintings and was a strong advocate for landscape painting being important in its own right as opposed to Turners use of historical or mythological references in some of his works especially those painted in oil. Landscape painting, according the course material, became a popular genre and instructional books were published in much the same way as they continue to be this day. I have always loved watercolour painting but it is only through the course of my textile studies I have really come to appreciate the washes and opaque areas and the techniques involved. The first painting I did was not a success – I hit a real painters block compared to what I know I can do and my techniques flew out of the window. This is the bridge at Kedleston Hall and I did not achieve the perspective either linear or atmospheric nor the textures or correct colours on the bridge. I am really note happy with this at all – I tried to add further detail with the use of colour pencils and this improved the situation a little but not enough. Asking for tips on one of the OCA student Facebook sites was useful – there were suggestions of adding in a further blue wash in the green behind the bridge to give the appearance of atmospheric perspective without realising that green was in fact meant to be foliage! Some students felt this painting had a child like quality about it which was endearing and that there are artists who specialize in achieving that effect – for me a child-like quality is something that comes easily even if it was not intentional! 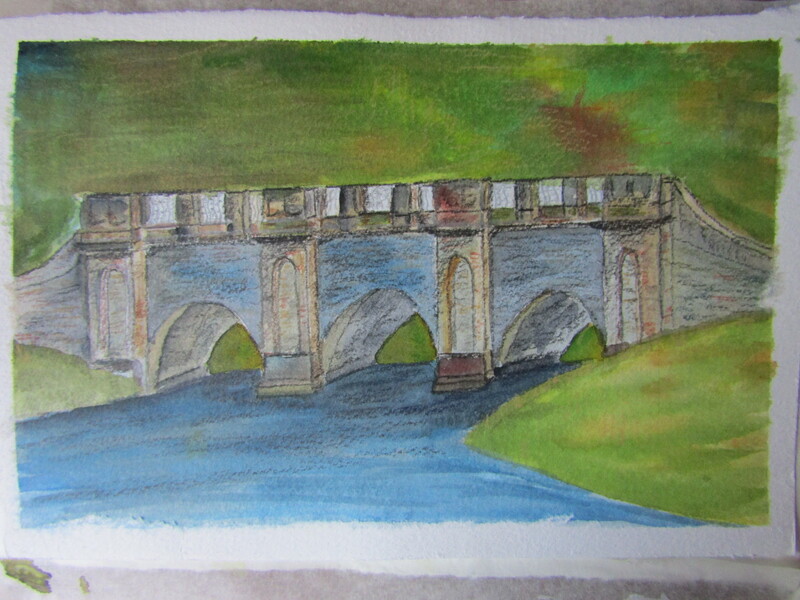 There were suggestions of adding drawn highlights to the stone to create the textures or shadow underneath the bridge as well as the effect of shadow both sides of the parapet on the left hand side of the bridge and both advice and critique was solid and good – I decided to leave it as it is for future reference of how not to do an exercise and what needs improvement. I have never painted a bridge before and consequently am not versed in painting stone blocks of any type and this is something I need to look at further now as I do not want to avoid painting architecture in the future – I love the hard lines against the foliage in a country setting. My second version I decided to look at the small waterfall just down from this bridge and this was considerably more effective for me. I used a succession of washes and wet-on-wet techniques to achieve the depth of foliage in the background and foreground – I wanted the appearance of a deep wooded area in the background with the path in the foreground gently sloping down. I also managed to achieve the water much better by using a combination of washes and wet-on-wet again and more importantly taking my time … the first I think I rushed a little in retrospect. The waterfall on this second painting was done using a combination of washes and also dry brushing using a fan style brush in specifically directional strokes. I have tried to give a sense of perspective with the river and made careful note of any reflections or shadows and attempted to recreate if possible and feel this was relatively competent. The only aspect I am really not happy with is the tree to the top left of the painting 0f the painting – the truck needs more shading and perhaps covering with a smattering of more foliage. Overall I am considerably happier with the second piece and am gaining increasing understanding of watercolour paintings and have no question that I will continue to work in this medium and with landscapes in particular. This entry was posted in Coursework, Part 4. Bookmark the permalink.